GRETNA – A local hospital is being sued for allegedly not treating a woman for six hours after she visited its emergency room for a heart attack that eventually led to her death. 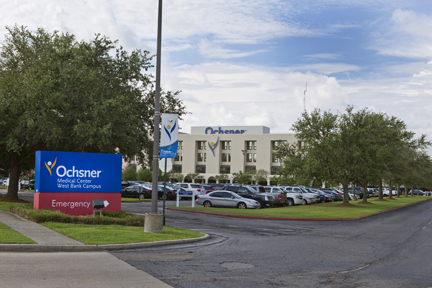 Wayne Jones, Jesse Bankston, individually and on behalf of the deceased Nelila Bankston-Jones, filed suit against Ochsner Medical Center-Westbank in the 24th Judicial District Court on June 11. Jones claims his wife, Nelila Bankston-Jones, appeared at the emergency room at Ochsner Medical Center-Westbank in Gretna in May 14 at 6 p.m. complaining of chest pains, whereupon staff members told her and her family that she would have to wait to be treated. The plaintiffs assert that it was clear Bankston-Jones was in severe distress and her condition was rapidly deteriorating. Jones and Bankston contend Bankston-Jones was given an aspirin and was told she was not having a heart attack. According to the filing, the plaintiffs allege Bankston-Jones suffered agonizing pain that caused her to scream in agony and for which she chose to lie down in a car outside after being denied a bed. Jones and Bankston allege they begged for help and that Bankston-Jones began vomiting blood and bile before she was finally treated, but that meanwhile valuable time had been lost. The plaintiffs contend that due to the defendants’ alleged inaction the necessary medical intervention became more difficult and required surgery after which she was transferred to a different hospital where she eventually died. The defendant is accused of medical malpractice, overlooking signs and symptoms of emergency, failing to timely determine the cause of the deceased’s pain and take appropriate steps, failing to timely consult with a physician, failing to provide proper medical attention, failing to supervise and monitor the patient, failing to timely perform the surgery and failing to prevent harm. An unspecified amount in damages is sought for mental distress, anxiety and wrongful death. Jones and Bankston are represented by Pius A. Obioha of New Orleans-based Law Offices of Pius A. Obioha & Associates LLC.